Over the last month or so we've polled on the favorabilities of seven newly elected Governors across the country. You might expect them all to be pretty popular if they were just elected but there's actually quite a wide range of voter reaction toward them as they begin their terms. Three- Brian Sandoval in Nevada, Matt Mead in Wyoming, and Rick Snyder in Michigan- go into office incredibly popular. Sandoval's favorability rating is 57% with only 20% having a negative opinion of him and 23% ambivalent. He even has a plurality of Democrats with a favorable opinion of him at 37% to 30% with an unfavorable one. That's something we don't see very often and it's something to keep in mind as Rory Reid contemplates his political future- certainly he wasn't the best candidate on earth but you can't blame his loss entirely on that- he was running against one of the more appealing candidates across the country last year. Marco Rubio might be the newly elected Hispanic Republican drawing the most national buzz right now but Sandoval is probably the stronger politician at least for now. Mead in Wyoming is almost as popular with 53% of voters having a favorable opinion of him, 17% an unfavorable one, and 30% without one at this point. In a state where more than 60% of voters are Republicans he wouldn't need particularly good numbers with Democrats to be popular overall, but they do see him positively by a 37/28 margin. Snyder in Michigan is not quite as popular as his new Republican counterparts in Nevada and Wyoming but still has great numbers overall considering the Democratic leaning state he serves, with 48% of voters seeing him favorably and 26% unfavorably. Snyder is not popular with Democrats but has a pretty remarkable 52/24 breakdown with independents, continuing the unusual level of favor with them that allowed him to win both the primary and general elections by bigger margins than anyone could have anticipated a year ago. Some of the newly elected Governors- Rick Scott in Florida in particular but also John Kasich in Ohio and Scott Walker in Wisconsin- are not particularly popular though. Scott's the one who's really bad off with only 33% of voters seeing him positively to 43% with an unfavorable opinion. He has very little appeal to Democrats and independents and even within his own party less than half of voters rate him favorably. Although Scott's numbers are bad they are actually slightly better than they were right before the election, indicating that some voters are giving him a second chance as he prepares to take office. 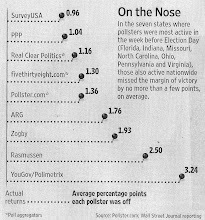 Walker and Kasich both have worse numbers than they did in our polls right before the election. Walker's favorability is a 41/49 spread and Kasich's is 36/40. One key reason for the disparity? We're now polling all registered voters in the states, not just 2010 likely voters as we were the last three months before the election. There was a steep drop in Democratic turnout compared to 2008 in both of those states that was a key part of the Republican victories and those Democrats who didn't vote aren't real big on their new Governors. Only 12% of Democrats in Ohio have a favorable opinion of Kasich compared to 65% with an unfavorable one. And in Wisconsin just 7% rate Walker favorably to 85% with a negative opinion. They don't have anywhere close to the sort of crossover appeal that folks like Sandoval and Mead do, and as a result they don't go into office particularly popular. The other new Governor we've polled on- Pennsylvania's Tom Corbett- doesn't really go into either the 'highly popular' or the 'unpopular' category. 39% of voters have a favorable opinion of him, 27% have an unfavorable one, and 34% don't have one at all. Republicans like him a lot but in a Democratic state like Pennsylvania that alone won't give you positive favorability numbers. He's above water because there are more Democrats who are ambivalent- 42%- toward him than there are ones- 40%- who have already formed an unfavorable opinion of him. They're at least giving him a chance. When did you poll Wyoming? Do you think that their forfeiture of federal funds for rail line construction damaged the popularity of Governors Walker and Kasich? They certainly got off to a very bad start with moves that few people really understood as making any sense. The voters who voted for Scott Walker (WI)haven't changed their minds. We voted against the train project, Milw. to Madison. Governor Doyle the previous Gov bought one anyhow.